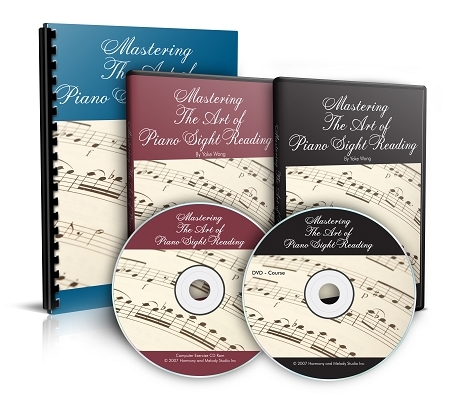 The course comes with 2 DVDs (2.5 hours video lessons), 1 CD (500 computer exercises), and 1 exercise booklet (196 pages). The downloadable version is available. If you are an iPad or Mac computer user, you need to download an app such as Photon Browser to view and play the interactive computer exercises. 10 months ago, my piano playing skills were poor. I'd taken lessons in the 80s, and loved to sight-read, but had let my playing go in the intervening years. I saw your online ad for sight-reading course, and told my wife I'd like the course for Christmas. Well, since then, I've practiced daily (literally), and worked your sight-reading course hard, plus have added another online sightreading site to my routine. I've gotten noticeably better, to my own ears, and have started back with my Bach 2 part inventions. I can improvise much better, and the piano is giving me so much enjoyment these days. I figure, I'll keep this up and see where I am a year from now! Pretty exciting for an "old" guy of 73 who's always loved piano music but missed out as a kid with lessons. I'm making up for lost time, now that I'm retired. Thank you SO MUCH for your online courses- they are wonderful! And thanks for the chance to play! Makes sight reading fun while you learn! I am slowly learning to sight read. I like the way Yoke Wong makes a game out of learning the notes above and below the staff. She makes learning a very positive experience. This course is Great!, Practice at your pace, stick with it, and you will definitely see results. It's helped me tremendously! Thanks Yoke! The sight reading exercises have been extremely helpful!! The sight reading exercises have been extremely helpful!! And thank you for being honest about how important it is for us to practice!! You said you can't help us, more less, unless we are committed to do our part. And that is PRACTICE!! I have read so many programs on line, that lead you to believe, that somehow, by magic, you will start playing if you get the course. I love to practice now, because, you make it fun and exiciting. Ok, the sight reading can get a bit boring, but the pay offs are well worth the effort!! I appreciate you sharing your many years of training and the knowledge you have gained. I can see, you have given MUCH thought to your slight reading program. The simple exercises you provide are amazing! They have helped me sight read, so much faster!! Plus playing the flash computer games have been a great help..... learning to read intervals, cool!! This is a BIG shortcut for me as I am returning to the piano, as an adult. It has helped with Moonlight Sonata, as well as Leibestraume, which I am still working on, I love that song! Like you I took classical lessons for several years, yet would not dare to try and play Happy Birthday without sheet music!